It's Monday, and we're headed south. Not a moment too soon as far as I'm concerned... it snowed yesterday! We'll get the house open and ready for winter, line up help for the next home improvement project, and replenish our Vitamin D levels on the beach! We'll return to central New York before Thanksgiving. I pulled it off the shelf a few nights ago and read the first fifty pages... seems perfect for the Halloween season. This is such an entertaining audio... who would have guessed? I'm around the 80% mark now and in no hurry for this book to end. I'm not sure... but it will be nonfiction because Nonfiction November begins next week. Hooray! We're on the road for several days. It's a 24 hour drive and we've found eight hours per day to be the upper limit of comfortable. That means at least three days in the car... and usually an extra day or two at one of our stopping points. There's always something new to explore! I'm jealous of your flight to warmth! 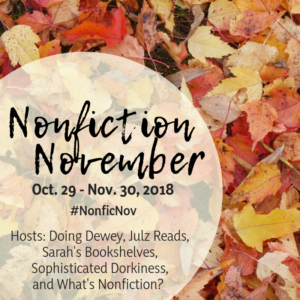 And glad you're participating in Nonfiction November! Sarah - Nonfiction November is the best! Thanks for hosting again this year. Audrey - Seems like sweater weather last for an hour in CNY... I've gone straight to down jackets! Happy to hear about The Library Book. No ebooks at my libraries yet and I don't dare reserve a hard copy until after the holidays when we're set in one location. 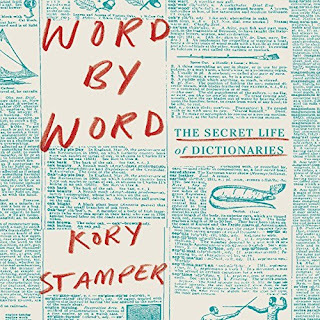 Finished Word by Word and loved it. That’s the way we love to take road trips, too! Stay safe and have a wonderful time! I'm hoping to do Nonfiction November, too. I've got several books on writing lined up, but there are also several other nonfiction books---the new Susan Orleans book and Dopesick---that I may read. Deb - I'm really excited about the new Susan Orleans book, too! Doubt I'll get it for Nonfiction November though. It's so nice that you take your time for the big drive south, stopping to enjoy the journey as you go. 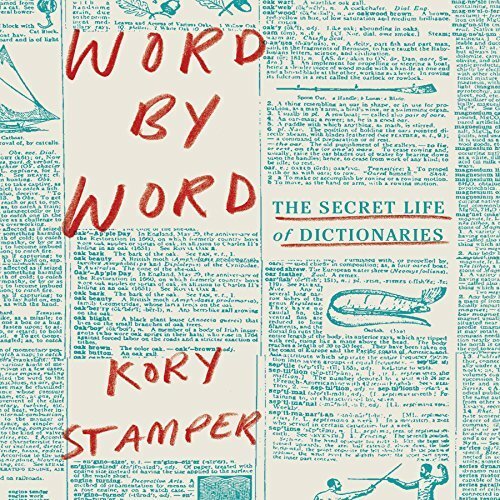 The book about dictionaries sounds intriguing. Who'd have thought! I re-read Mary Stewart at times. Never disappointing! Harvee - This only only my second Mary Stewart book... so good! Word by Word sounds right up my alley. I hope your trip goes well. I'm not a fan of traveling by car but do it nonetheless. Enjoy your time in FL. I hated the weather for the most part this summer, but, I'm not ready for snow either. Hope you read some good NF in November. Diane - It wasn't a great summer... in our area they're saying it's the most humid one on record. I believe it! I'll take a little snow around the holidays, but that's all I need, lol. 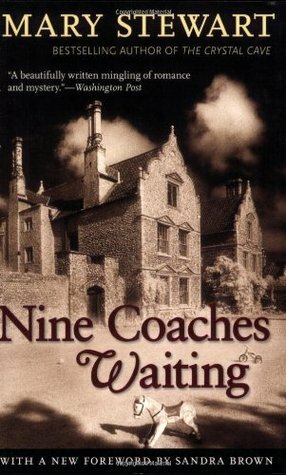 Love the sound of Nine Coaches Waiting. Enjoy your road trip, and thanks for visiting my blog. Laurel-Rain Snow - It seems very Gothic... perfect for the season! Word by Word sounds interesting! Ooh, and nonfiction November... I have a few books that fall in that category. 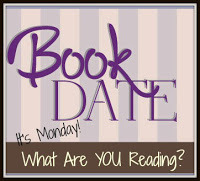 Emma - Hope you decide to join in for Nonfiction November! Snowbirds are fleeing from my part of Minnesota too. I don't mind winter because I don't have to go out. If I do, I can wait for a good day. I haven't thought of Mary Stewart for years. I loved her books back in the day. Come see my week here. Happy reading! Kathy - Winter isn't as bad when you have that kind of flexibility. I'm enjoying Mary Stewart! Enjoy your time in FL. I get it about driving for 8 hours, etc. We have a 9+ hour drive to get to NM and it's a little more than I want to do. My backside doesn't like sitting for that long. We usually break it up into a 3 hour and 6 hour journey. That way we arrive in NM in time to go to the grocery store and get settled. Kay - Yup, that's exactly what we'd do with a 9 or 10 hour dive.... it makes arrival day so much easier, too! I only discovered Mary Stewart a few years ago. This is my second of her books and it's very good so far. Word By Word sounds good. I hope you have a great time in Florida and that it doesn't get very chilly. I can do with a little less heat and humidity, but cold without snow is ridiculous. Enjoy your trip down south! We haven't had snow yet, but it's been really cold in the mornings! Looking forward to Nonfiction November, too! Angela - After your recent post, I'm hoping to read Radium Girls next month... maybe even a read/listen combo! I'll bet you are very happy to be heading south! We've done the 8-10 road trips in the past, but we can't do that anymore. My sciatica can't handle it. We're good for about 200-250 miles a day (RV driving is always slower, though). I'm very excited about Nonfiction November. I'm hoping it will help get me back into a reading mode. I haven't read a thing in over a month! Word by Word sounds like something my hubby would enjoy. Maybe I'll get it for him and read it when he's finished. Enjoy the sunshine! Over the last week I have been reading the dark historical fiction, A Gathering of Ghosts by Karen Maitland, which I thought would be perfect for this season. Jessica - This is the best time of year for darker stories. Glad you're enjoying the book. I didn't do very well with RIP this year.